In The Great Cholesterol Myth nutritionist Jonny Bowden and cardiologist Dr. Stephen Sinatra reveal the true causes of heart disease. For years we’ve been told that cholesterol is the cause of heart disease. But recent evidence suggests that traditional protocols – with their emphasis on lowering cholesterol levels – are ineffective and have negative side effects. More than half of the people hospitalized with heart attacks have completely normal cholesterol levels. Lowering cholesterol has limited benefits for patients with cardiovascular disease. For at least 95 percent of the population, dietary cholesterol has nothing to do with blood cholesterol. Cholesterol-lowering statin drugs can be extremely toxic and have serious side effects. This book was created to give readers a strategy for effectively preventing, managing, and reversing heart disease without pharmaceutical drugs. It outlines a simple lifestyle plan with suggestions for diet, exercise, nutritional supplements, and stress management. Research also demonstrates the negative effect of high glycemic carbohydrates on the heart. After just a single high-sugar meal it is possible to observe stress on the arteries. High glycemic carbs also contribute to insulin resistance, which in itself is a primary risk factor for heart disease. Studies show that the higher the intake of vegetables, the lower the chance of developing cardiovascular disease. Those who consume eight or more servings of vegetables a day have a 30 percent lower risk. Nuts contain an amino acid called arginine that protects the lining of the blood vessels. Eating nuts several times a week may reduce your risk of a heart attack by 30 to 50 percent. One serving of beans or lentils a day can reduce the chances of a heart attack by 38 percent. They are an excellent source of fiber and are very high in antioxidants. Beans also contain folic acid, which reduces the levels of an inflammatory compound called homocysteine. Dark chocolate lowers blood pressure and studies show that it may reduce the risk of death from heart disease by half. For cardiovascular health it is recommended to exercise for at least thirty minutes every day. This can strengthen your heart and increase your resilience against cardiovascular disease. The authors also discuss the benefits of activities such as yoga and deep breathing for stress reduction. 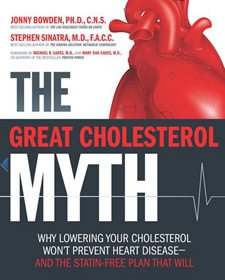 The Great Cholesterol Myth: Why Lowering Your Cholesterol Won’t Prevent Heart Disease-and the Statin-Free Plan That Will retails at $19.99. There is also now a cookbook available to accompany this diet. Dispels some of the myths regarding the relationship between cholesterol and cardiovascular disease. Provides information to help reduce your risk of developing heart disease. Offers an alternative to pharmaceutical drugs for the management of these conditions. Information is supported by scientific research. Authors are recognized as experts in the subjects of nutrition and preventing heart disease. Many people will require more guidance on how to construct a healthy diet. Some readers may find the book overly scientific. Information is not provided on potential interactions between nutritional supplements and pharmaceutical medications. Does not adequately distinguish the difference between processed carbohydrates and healthy vegetarian carbohydrates. This book aims to dispel the myths about cholesterol and heart disease, while offering a drug-free approach to prevent heart disease. The advice offered is that eating right, exercising regularly and managing stress is the most effective way of to stay healthy.